While doing our recent REVIEW: Man Pans Stir Fry Wok & Steamer Set, I made some of this fabulous, veggie-friendly soup. I also promised to share the recipe. Since I never lie (well, almost never ;)) here it is! Oh, and by the way, this gets rave reviews from the Cavewoman, a lifelong vegetarian, as well as from the Cavekids and me, lifelong carnetarians! Though, as you’ll see, this is easily adjusted to satisfy the meat-only crowd. Chop the green onions, water chestnuts, and tofu into small bite sized pieces. 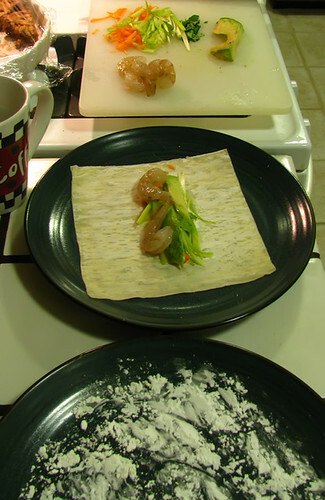 Then, take about 1/5 of each ingredient and chop that portion more finely for use inside the wontons. Set aside. 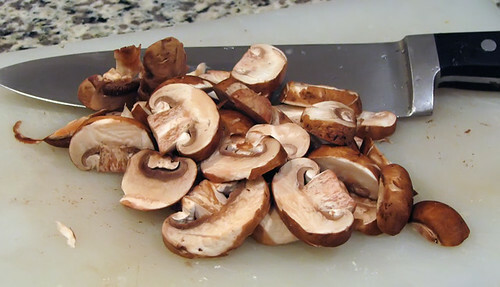 Thinly slice mushrooms. Set aside. 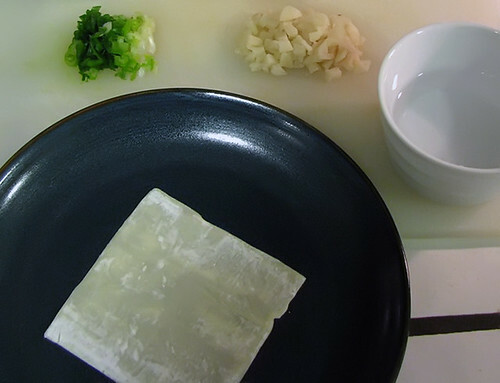 Set up a work station with the wrappers; a glass of cool water; a clean, dry plate to make the wontons; a plate covered lightly in corn starch; and the finely chopped ingredients. 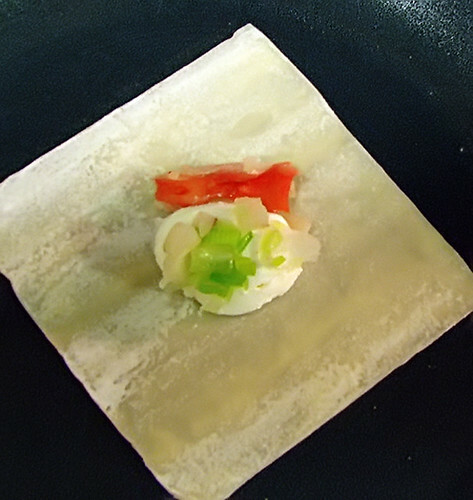 To make the wontons, put a single wrapper in the center of the clean plate. Place an appropriate amount of each ingredient onto the wrapper (don’t overstuff the wrapper or it will tear when you take the next steps). With a slightly wet finger, moisten all for edges of the wrapper. Fold one corner of the wrapper up to it’s opposite corner, and firmly seal all edges together. Place the completed wontons on the corn starch plate, taking care not to lay them on top of each other to prevent them from sticking together. NOTE #1: If you have any leftover wonton “filling”, just save it and throw it into the soup at the appropriate time. 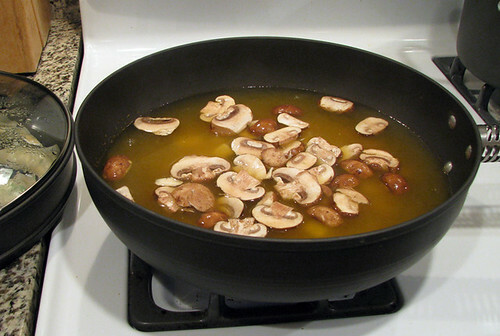 Place broth into properly sized sauce pan or wok and bring to a boil. While many recipes call for you to boil your wontons, I find that doing so tends to create very soft wontons that readily fall apart. To combat this, I like to steam them before adding them to the soup. It should only take 5-8 minutes to fully steam the wontons. NOTE #2: By using this Man Pans Stir Fry Wok and Steamer Set, I am able to steam the wontons with the boiling veggie stock. Not only is this convenient and eco-friendly, I think it also adds to the flavor of the wontons. 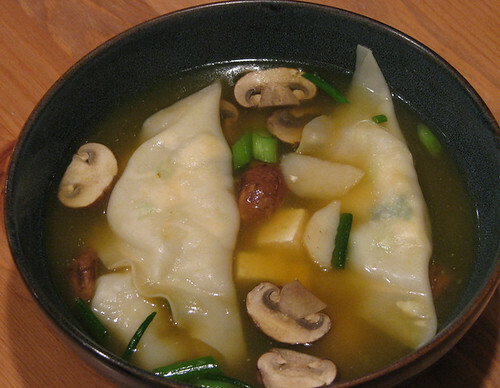 When wontons are fully steamed, remove the steamer insert and add the tofu, mushrooms, and water chestnuts. Return to boil for another 3-5 minutes. 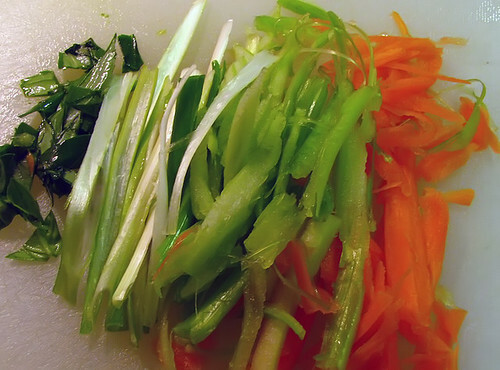 Reduce flame, add green onions and sesame oil. Gently add wontons. Salt and pepper to taste. Stir gingerly. Allow to simmer for 10 minutes. NOTE #3: If you are adverse to any kind of spiciness, just go with the plain variety of sesame oil. But, if you like just a hint of tang, go for the “chili” version. It won’t make it very spicy at all, but it will add a nice essence. Serve in bowls along with any of your other Asian favorites. It also makes a fine main course, too. HINT: This soup is easily transformed into a carnivore version by using the filling from our Lamb Wontons instead. Just be sure not to fry them, as described in the recipe. Also, you may have to steam them for a few more minutes to make sure they are cooked enough. Add some shrimp or chicken chunks to the initial broth boil and you’ll have a delicious meat-lovers rendition of this soup. If you’d like to win one of these Man Pans Stir Fry Wok and Steamer Sets, or even an entire set of their pans, be sure to enter our Want Pans? Giveaway. Hurry, though, because the contest ends 12/15/2010. EDIT: THIS CONTEST IS NOW CLOSED! This photo won a Flickr Award! My penance continues … the second of three tasty recipes in 24 hours! 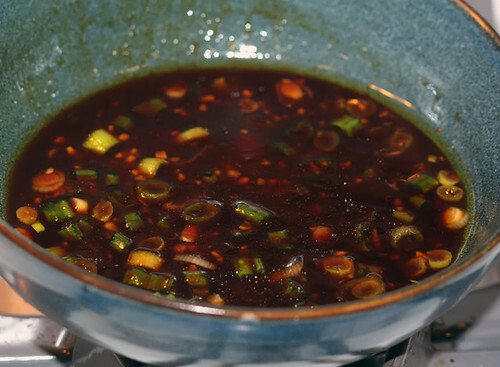 This is the perfect companion to the Hoisin Galbi Marinade. Place pork chops into large zip-lock bag. Pour marinade over chops, seal bag, and make sure chops are evenly covered with sauce. Place bag on plate and refrigerate 4 to 24 hours. Be sure to flip bag over about halfway through marinating time. 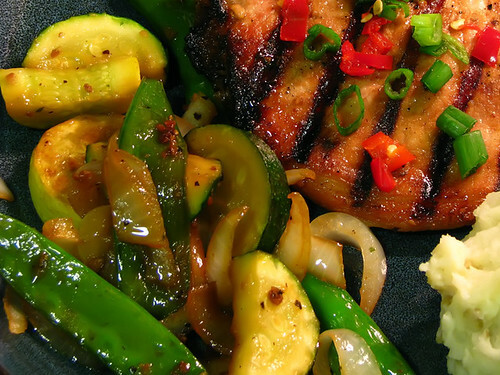 When ready to start cooking, remove chops from refrigerator and let stand 10 minutes. Chop onion and mince peppers, set aside. These can be pan fried, stove top grilled, or barbecued. Of course, being a Caveman and all, I opted for the latter. Cook on a medium-high heat, taking care not to over-cook (4-5 minutes per side). If done right, the pork chops will be tender and flavorful. But, if over done they get tough and loose much of their delectability. HINT: If barbecuing, do not cover while cooking. They will cook too fast and dry out. When done, remove from heat. 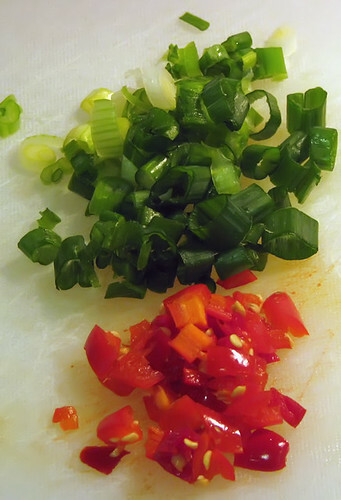 Garnish with chopped green onion and minced peppers. 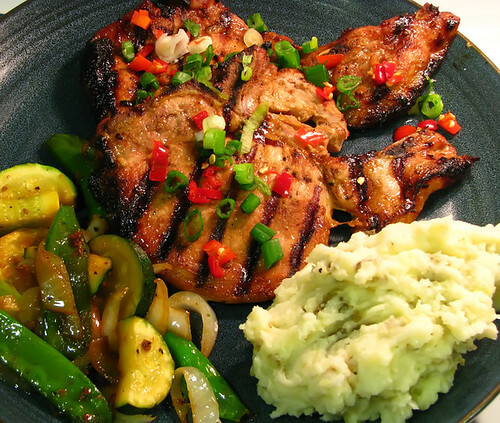 Served here with Sauteed Asian Vegetables and Garlic Mashed Potatoes. NOTE: I would normally serve this with steamed rice. But, the Cavekids really wanted the mashed ‘taters … which worked incredibly well with this dish. I apologize that this blog has been recipe-free the last few days. Instead of making excuses, how about if I just serve up three tasty recipes in 24 hours?!?! First, this classic Korean meat-marinade … with a Caveman twist. Combine all ingredients in a bowl and mix well. Marinate meat in a plastic zip-lock bag for 4 to 24 hours, refrigerated. 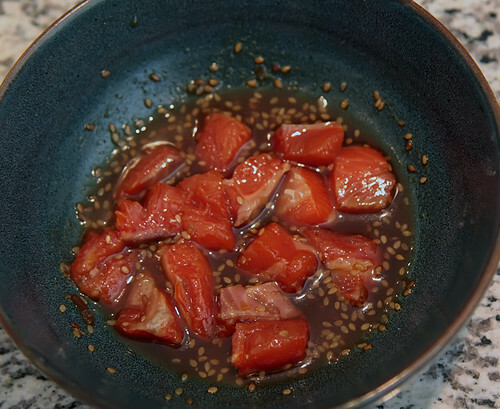 Works well with beef, pork, chicken, and even fish that lend themselves to marinating, like salmon. 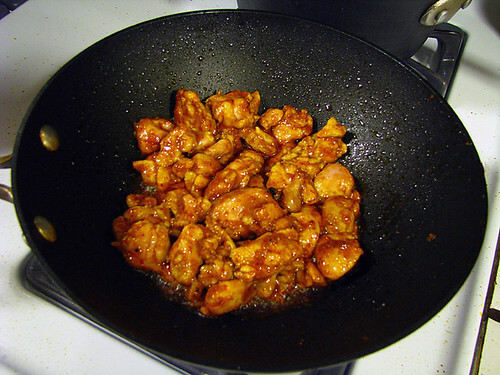 HINT: If you like a little heat in your food, use Sesame Chili Oil instead of the plain variety. Craving even more heat??? Squirt in some Sriracha Sauce. This recipe won Post of the Day for 1/19/10! 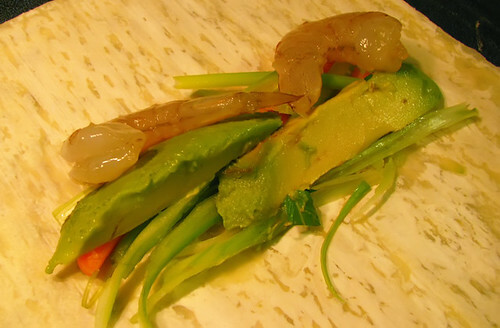 Thought Shrimp Rolls were only for restaurant dining? Think again! Rinse and drain shrimp. Remove tails, shells, and veins. Re-rinse and drain. Cover and refrigerate until ready for cooking. Sliver carrots, celery and onions. Chop Basil. Slice avocado. Set aside. Next, set up your prep station with a prep plate, another plate dusted with corn starch, a cup of water and, of course, all your ingredients. Place egg roll wrapper on prep plate and put 1/4 of all ingredients onto wrapper. Fold one horizontal-to-food edge of wrapper over ingredients. Then, using 3-4 fingers, gently pull folded side back towards ingredients, making sure wrapper is snug against them. Next, fold over both open ends of roll up to the point where the ingredients are. 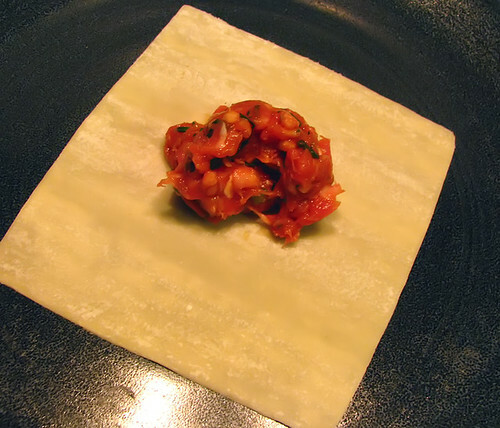 Roll the wrapper with ingredients toward the opposite horizontal edge. Just before reaching the end of the wrapper, run a wet finger along the edge of wrapper, then continue to finish rolling to the end. Lightly pinch the edge to the roll so that it doesn’t flop open. Place onto plate with corn starch. Repeat process until all rolls are made. 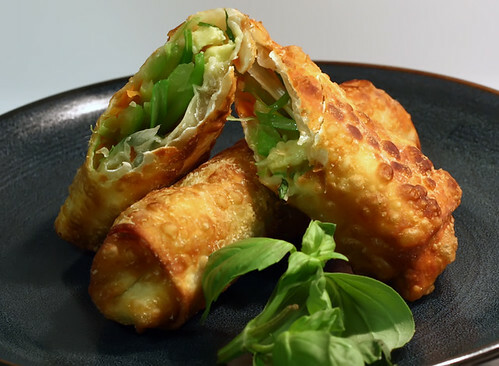 You can either deep fry or pan fry your Shrimp Avocado Rolls. Either way, heat your oil to about 375°. 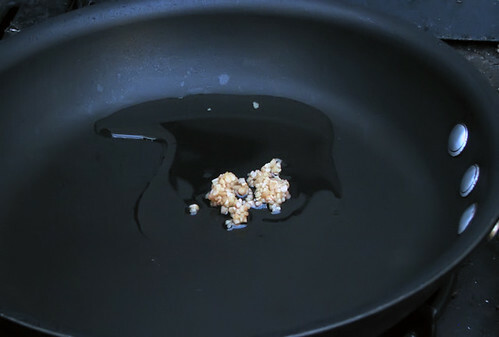 If pan frying, make sure you have enough oil in the pan to cover at least half of the roll. When the bottom half turns golden brown, flip over the rolls and continue until evenly cooked on both sides. 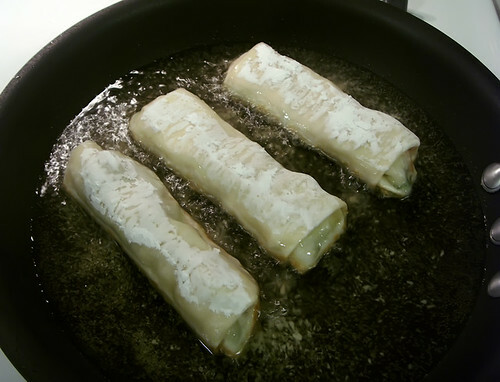 When done, remove rolls from oil and place onto paper towels to absorb excess oil. Allow to cool several minutes before serving. HINT #1: Cut rolls in half with a sharp knife. They will cool quicker that way and won’t burn your mouth if you get have an unexpected hot-pocket of oil inside the roll. Serve with your favorite Asian dipping sauce. These were served these with a spicy Plum Sauce – just 4 tablespoons of store-bought Plum Sauce combined with a heaping teaspoon of Ground Chili Sauce. 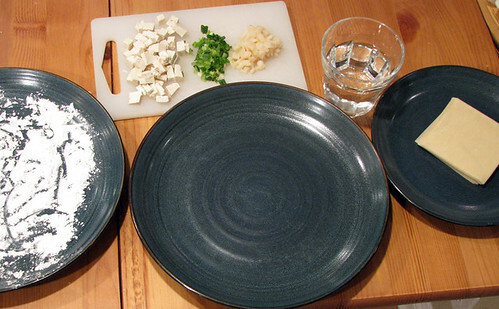 HINT #2: You can serve this as an appetizer, or plate with some Asian noodles to make it part of your main course. This is delicious, traditional Thai table fare. It has a little heat, but it gets cut by the Coconut Milk. Definitely worth a try! NOTE: I usually use peas and red bell pepper instead of green beans, but I saw an opportunity to get two ingredients into the Freezer Food Fest. It also goes to show that this recipe can accommodate just about any tweeks you want to attempt. Try broccoli, snap peas, bamboo shoots, etc. They all work incredibly well and help create variety for each incarnation of this delicious dish. Chop carrots, mince garlic, and slice basil. Set aside. 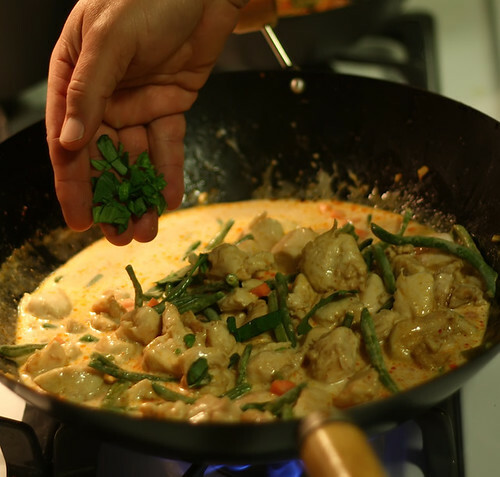 HINT #1: Try to get authentic Thai Panang curry paste and Thai coconut milk, if you can. The taste and texture difference from their Americanized counterparts is very noticeable. If you can’t find Panang paste use the widely available Thai Red Curry paste and add some ground Kaffir Lime leaves (again, if you can find them) or zest of lime. 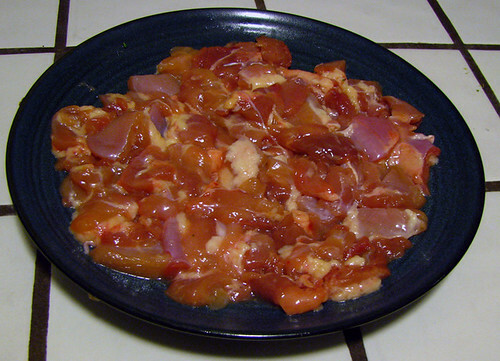 Cut chicken breasts into medium bite-sized pieces. Set aside. 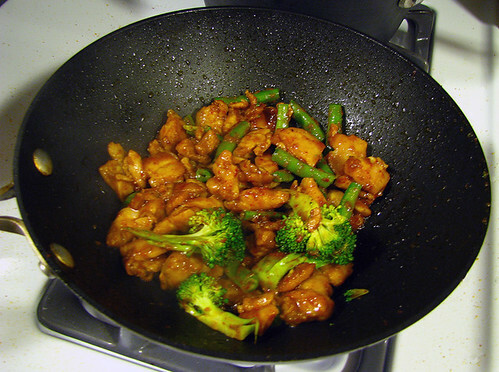 Heat oil in wok or stir-fry pan. 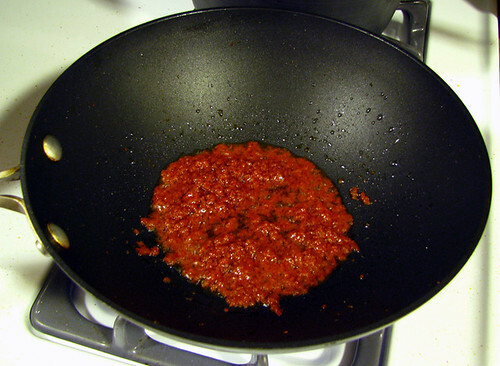 Add garlic and curry paste, saute for 2-3 minutes. Add chicken to pan. Cook fully. 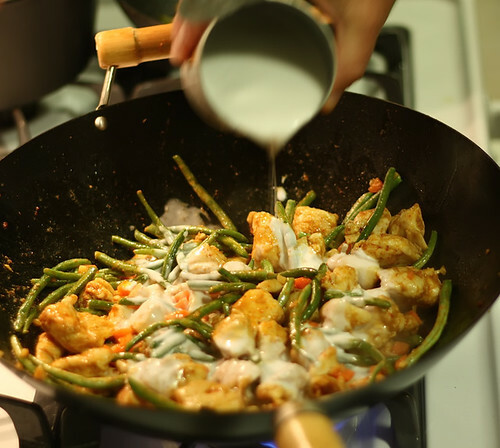 HINT #2: If things start to get too dried out in the pan, add a small splash of the coconut milk or some water. Add green beans and carrots … everyone into the pool! Stir in for about a minute. Add Coconut milk and stir in well. Stir in basil while barely bringing liquid to a light boil (just starting to show bubbles). 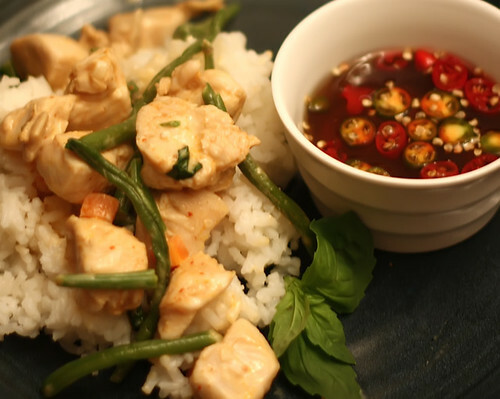 Remove from heat and serve over steamed rice along with some Thai Table Sauce (Prik Nam Pla). HINT #3: This recipe can easily be made veggie-friendly. Just substitute some Extra Firm Tofu for the chicken. Be sure to lightly brown the Tofu in a little bit of oil FIRST. Then proceed as chronicled above. ©2009 Caution: Caveman Cooking/UHearMe, Inc. All rights reserved. This recipe originally appeared on the Caution: Caveman Cooking blog at http://cavemancooking.net authored by Caveman. This recipe may be shared and reprinted as long as this entire copyright message accompanies it. A flavorful follow-up to the King Crab Wontons. BTW, these were a big hit at our family Holiday shindig! Place all ingredients (except wrappers, corn starch, and oil) in a mixing bowl and combine well. I like using a zig-zag wire potato masher for this job. 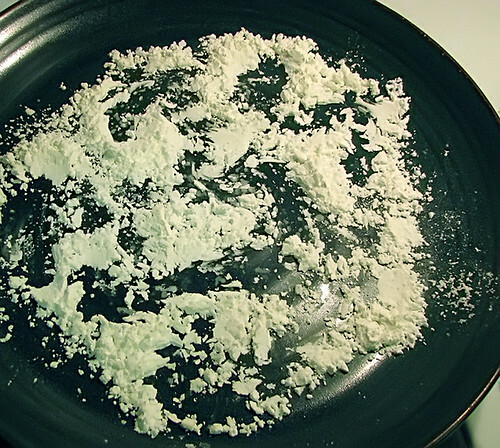 Split corn starch evenly and spread onto two plates. Set up your work station with a clean prep plate, small bowl of room temp water, wonton wrappers and bowl of lamb mixture all within easy reach. HINT: Have a paper towel handy to dry your prep plate in between each wonton that is formed. Position a single wonton wrapper on the prep plate. Place 1/2 of a tablespoon of the meat mixture in the center of the wrapper. Wet your finger with water and moisten two adjacent edges of the wonton wrapper. Then, diagonally fold the dry edges over onto the wet edges and firmly seal together with your finger. Finally, moisten two opposite corners, fold and seal together. Ta Dah! You have just made a “Bishop’s Hat” wonton!! Place completed wonton onto corn starch plate. 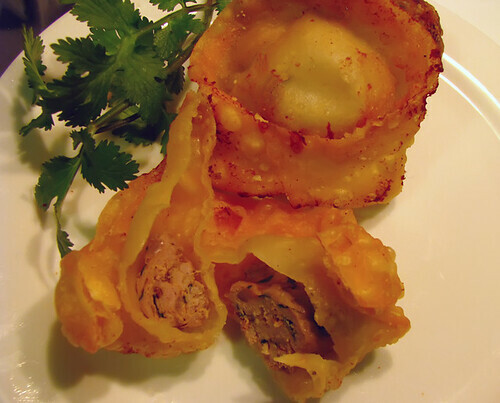 HINT #2: Try experimenting with different shapes of wonton. For example, you can position the wrapper as a rectangle, moisten the edges along the top half, then fold and seal lengthwise. Pinch the ends and make a “George Washington’s Hat” (pictured below with Bishop’s Hats). Just be sure all edges are well sealed. When all wontons have been made, cover loosely with plastic wrap and place in freezer for 15 minutes. This helps them retain their shape when placed in hot oil. HINT #2: If 24 wontons are too many for your immediate needs, before cooking, just place the extras in a container and freeze until ready for use at a later date. 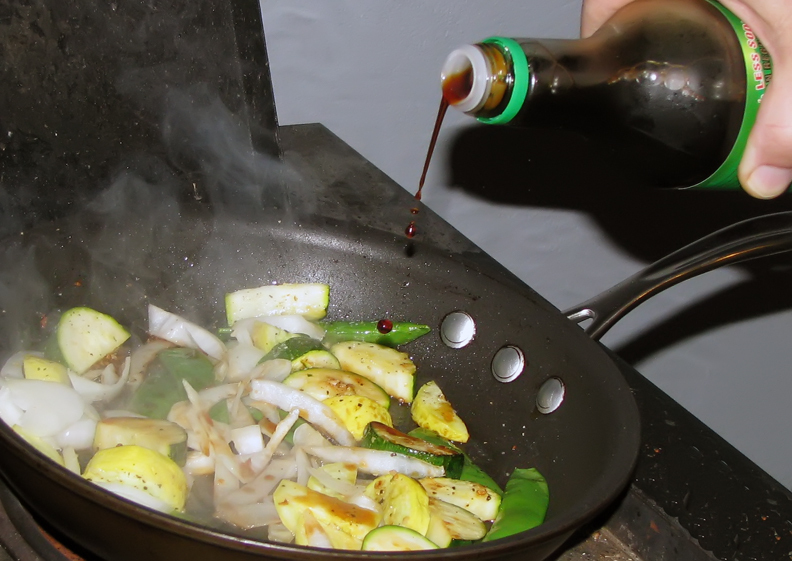 Heat oil in a wok, stir fry pan or large sauce pan. 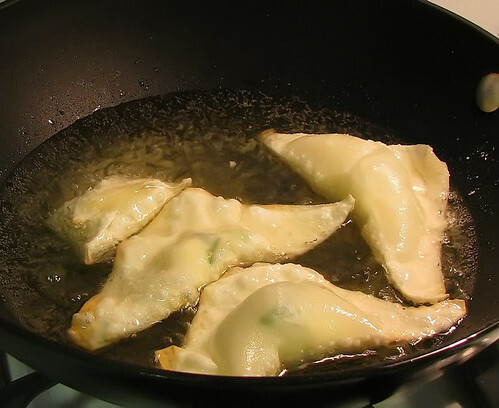 Place 5-6 wontons in oil and cook until edges start to turn golden brown. Then gently flip them over with a slotted spoon and continue to cook until entire wonton starts to turn golden brown. 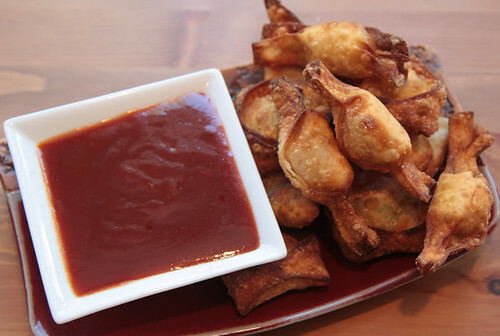 Gently remove wontons from oil with slotted spoon and place on plate lined with paper towels to absorb excess oil. Continue process until all wontons are cooked. Let stand 2 minutes, then serve with Plum Sauce and/or Duck Sauce. A neo-Caveman’s twist on an ancient Chinese delight. Mince water chestnuts and finely chop green onion. Set aside. Use kitchen shears or nut cracker to open crab legs and remove all meat. Break into small bite-sized pieces. 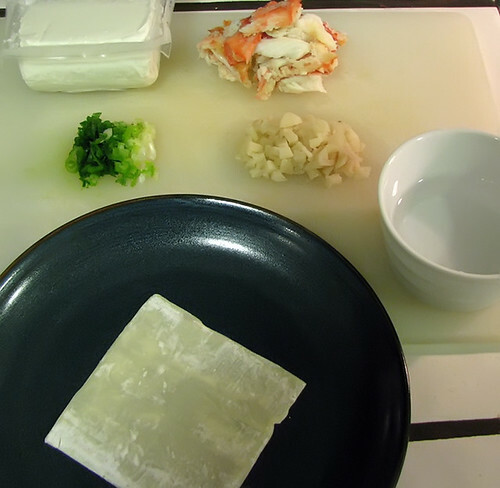 Set up a work station with crab meat, cream cheese, green onion, water chestnuts, wonton wrappers, a small bowl of water, and corn starch plates all within easy reach. Position a single wonton wrapper on a clean, dry plate. 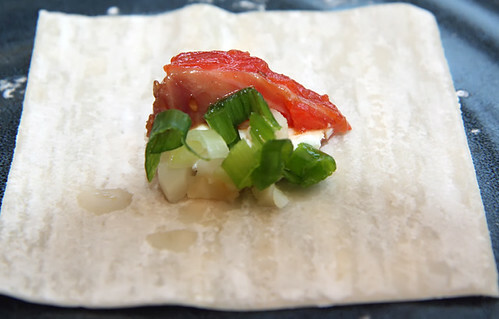 Place 1 teaspoon of cream cheese, an equal amount of crab meat, and a pinch each of green onion and water chestnut in the center of the wrapper. Wet your finger with water and moisten two adjacent edges of the wonton wrapper. Then, diagonally fold the dry edges over onto the wet edges and firmly seal together with your finger. Finally, moisten two opposite corners, fold and seal together. BINGO! You have just made a “Bishop’s Hat” wonton!! 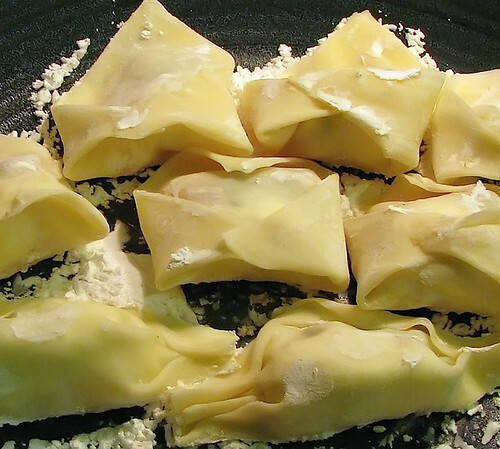 HINT: Try experimenting with different shapes of wonton. For example, you can position the wrapper as a rectangle, moisten the edges along the top half, then fold and seal lengthwise. Pinch the ends and make a “George Washington’s Hat” (pictured below with Bishop’s Hats). Just be sure all edges are well sealed or the cream cheese will leak out during cooking. Then gently flip them over with a slotted spoon and continue to cook until entire wonton starts to turn golden brown. 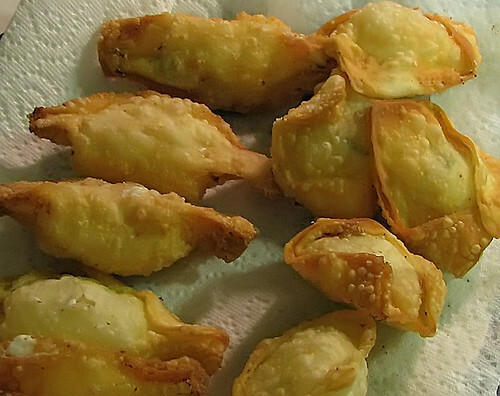 Gently remove wontons from oil with slotted spoon and place on plate lined with paper towels to absorb excess oil. Continue process until all wontons are cooked. Serve with Chinese Plum Sauce for dipping. I like to spice mine up a bit with several shakes of the Chili Oil bottle. A Caveman’s take on a classic Thai dish. 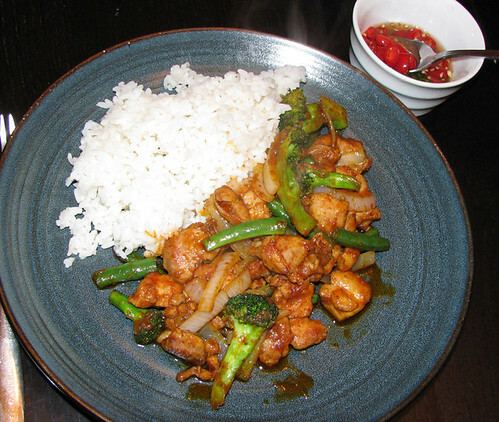 Besides, I had to give you something to put the Thai Table Sauce (Nam Pla Prik) on! 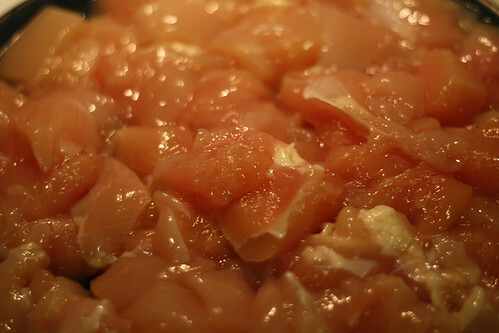 Skin, then bone chicken and cut into bite sized pieces (approximately 1 square inch). 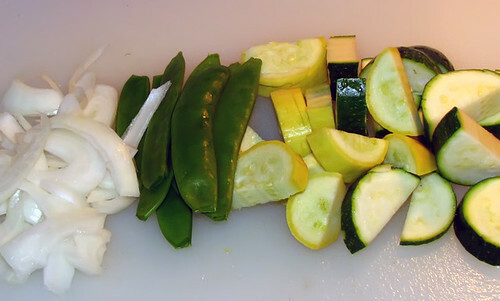 Chop all veggies into bite sized pieces. 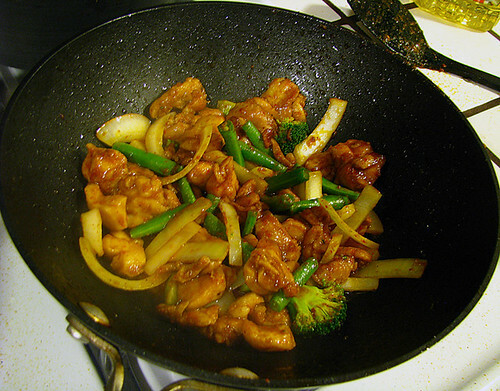 In a Wok or Stir Fry pan, heat oil over a medium high flame. Add curry paste and stir fry for about 3 minutes. Add sugar and stir in well. 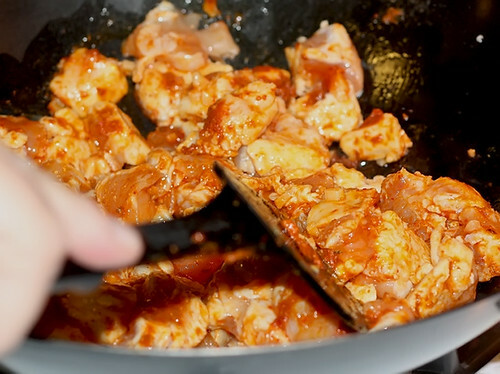 Then, add chicken and cook until almost done, stirring often. 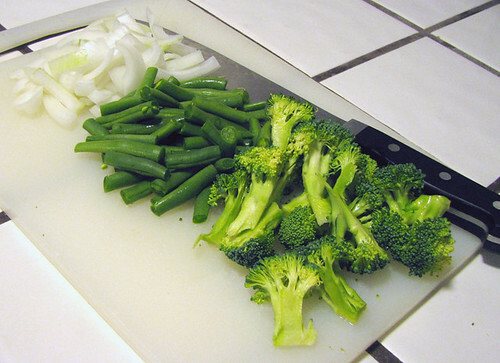 Add broccoli and green beans and stir fry for 1-2 minutes. 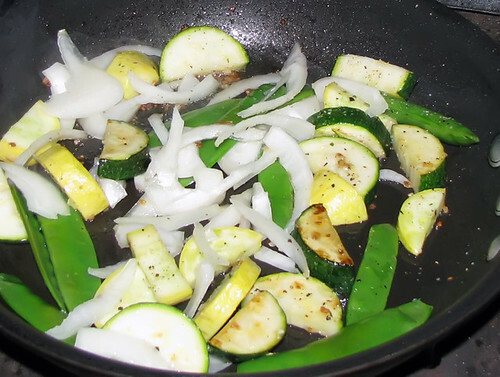 Don’t over cook the veggies, or they get too soft and lose much of their nutritional value. Add onions and stir fry an additional minute. 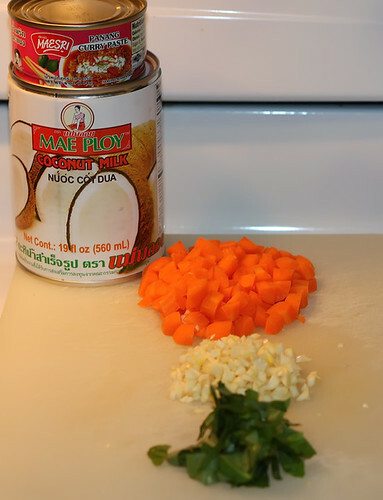 Remove from flame, and serve with steamed rice and Thai Table Sauce (Nam Pla Prik). 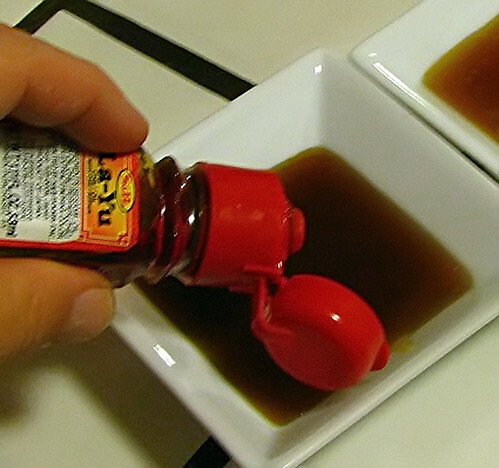 HINT #1: If this condiment is too spicy for you, just use some plain Fish Sauce to add some additional flavor. NOTE: Traditionally, this dish is made only with green beans and meat, but I like throwing in the broccoli and onions for added flavor and complexity. 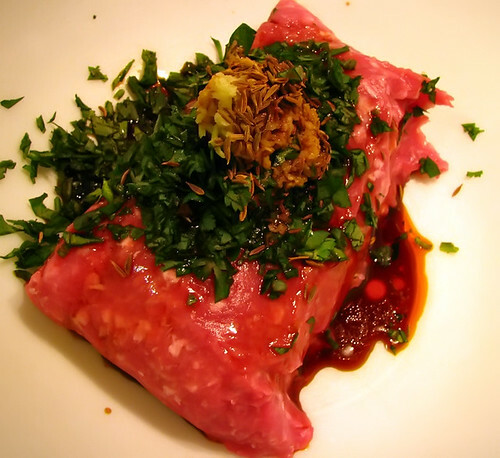 This dish can also be made with beef, pork, lamb, shrimp or tofu! While you can make your own curry paste, there are several authentic canned Thai pastes available that are great. Trader Joe’s has a decent one (in a small bottle), too. 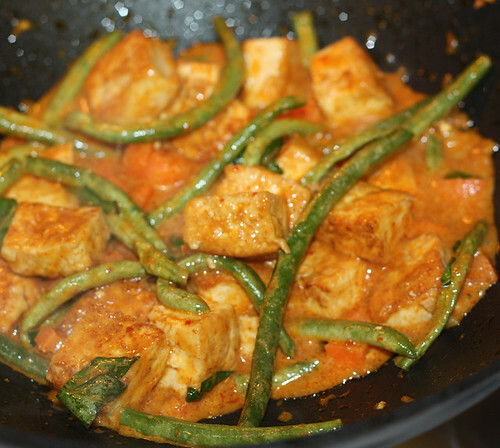 HINT #2: If making this recipe with tofu, be sure to lightly brown it in the Wok with a little oil before adding it to the curry paste, oil and sugar.